by Elizabeth Kolbert | Nonfiction | This book has not been rated. "Over the last half-billion years, there have been five mass extinctions, when the diversity of life on earth suddenly and dramatically contracted. Scientists around the world are currently monitoring the sixth extinction, predicted to be the most devastating extinction event since the asteroid impact that wiped out the dinosaurs. This time around, the cataclysm is us. In prose that is at once frank, entertaining, and deeply informed, New Yorker writer Elizabeth Kolbert tells us why and how human beings have altered life on the planet in a way no species has before. Interweaving research in half a dozen disciplines, descriptions of the fascinating species that have already been lost, and the history of extinction as a concept, Kolbert provides a moving and comprehensive account of the disappearances occurring before our very eyes. 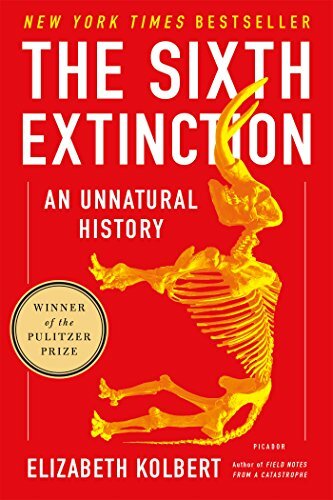 She shows that the sixth extinction is likely to be mankind's most lasting legacy, compelling us to rethink the fundamental question of what it means to be human." Not a book for the faint hearted. It's an eye opening book - Elizabeth Kolbert dug into several schools of research to write a fascinating read, that definitely made me question what it means to be human, as promised on the back cover. Will be brought to Calgary bookcrossing and handed off to a new reader (hopefully). Picked this up at the November Calgary BookCrossing meetup. Heard very good things about this one. Looking forward to reading this.